We can hardly wait for the über-charming design star, Miles Redd, to hit the Antiques & Garden Fair on April 11! In order to whet our appetites for all things Miles, the fabulously talented Redd graciously agreed to answer a few of our questions—a little hint of what’s to come when he comes to town. All we can say is buy your lecture tickets now so you don’t miss this design legend in the flesh! There is an art to mixing materials, periods, and styles in order to create interest and harmony. You get it right every time. What’s your secret? I think Picasso said it best: “good artists copy, great artists steal!” I really love to look at the masters, past and present, and really, it is simple; you imitate what turns you on. Also, a feeling in my gut helps a lot! We’d say you’ve definitely mastered old Hollywood glamour! Does your background in film and set design influence you as an interior designer? When I was young, blockbusters were among my best friends. I do love the interiors of films in the 1930s, ’40s, and ’50s. They give you a fantasy of what they want it to be, rather than how it probably was, and you know, often it is better—the fantasy, that is! Which designers inspire you and your work today? Which “up and comers”? That is a long list, but here goes: Nancy Lancaster, Albert Hadley, Syrie Maugham, Elsie de Wolfe, Francis Elkins, Jansen—and then today I love what Studio Peregalli is doing, and I think Daniel Romualdez has lots of style, and David Kaihoi—a very talented guy in my office—is a terrific springboard. (His apartment was on the cover of House Beautiful and worth a Google search!) Do you think will have staying power in the business? Danielle Rollins and Miles Redd begin to dress the table in his garden. Photo by Quentin Bacon. We read that you enjoy the view of your garden from your bedroom. What kind of garden have you created in New York City? Very much a French architecture—it’s all about clipped hornbeams and boxwood and deep turquoise treillage—very architectural, with no flowers…my kind of garden. You must adore hunting for unique furniture and objects through dealers at shows like this one. What advice do you have for someone shopping an antiques fair? If you love it, and the price is right, seize the moment! The worst is regretting something you should have gone for! 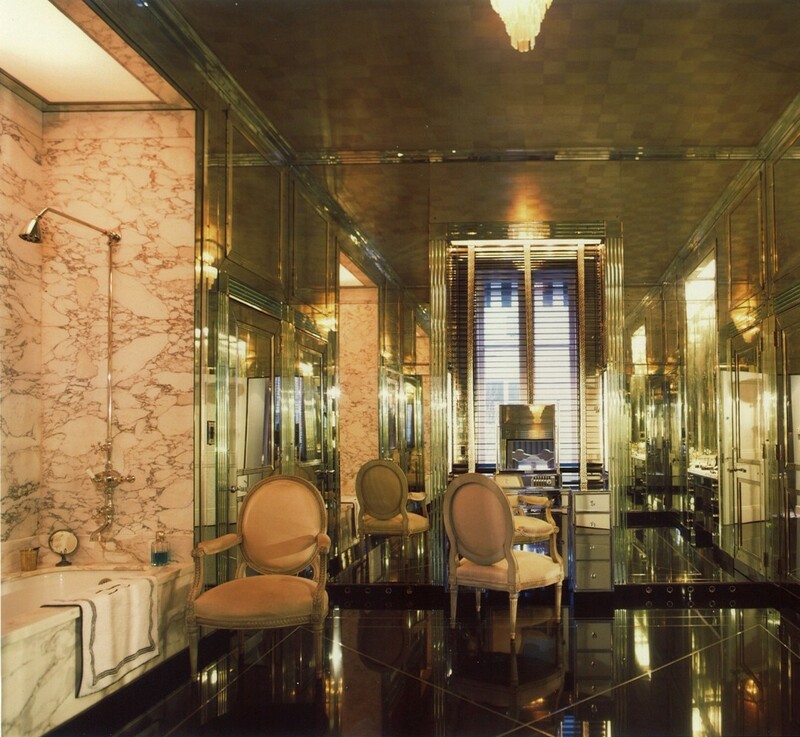 A master bathroom designed with Hollywood glamour by Miles Redd. Photo by Paul Costello.